It's definitely a common complaint with our customers here at Waggle so you're not alone. 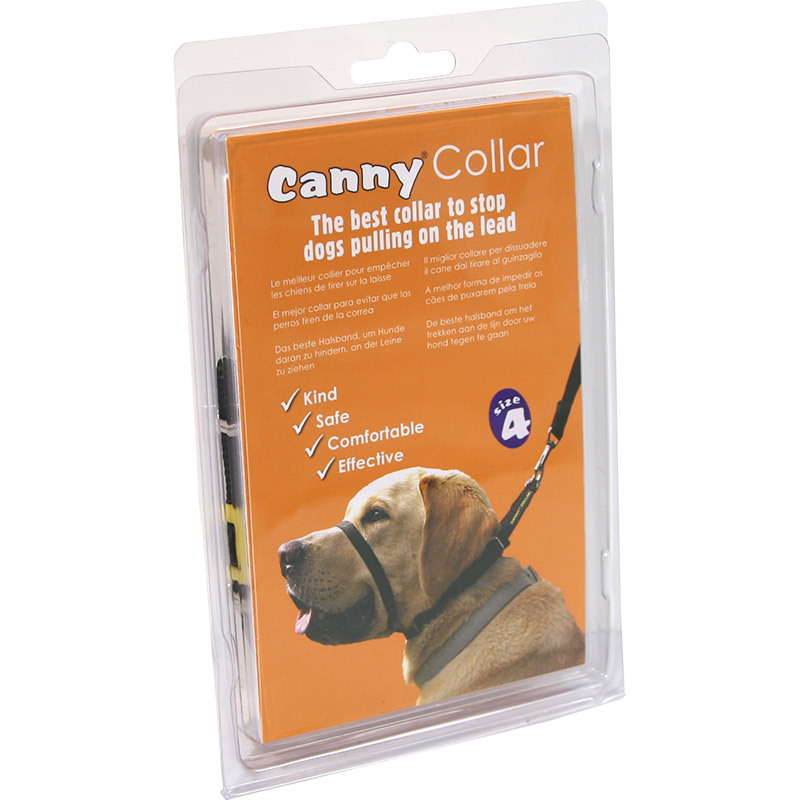 The Canny Collar comes highly recommended by the training community as a pull prevention collar. 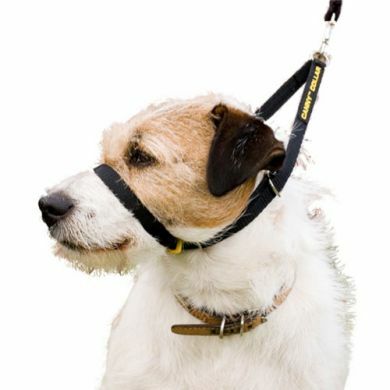 We like it because the Canny Collar attaches to the lead at the back of the dog's head and the motion of pulling on the lead brings your dog's head down in a smooth natural motion. 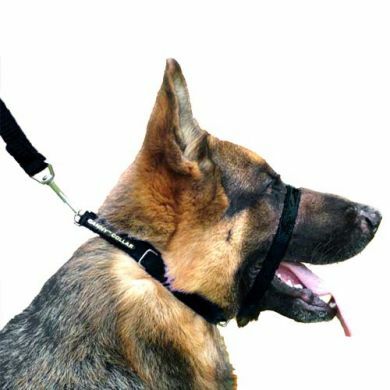 Other head collars designed to stop pulling often have the lead attach at the front and as a result they can jerk your dog's head awkwardly to the side which is probably not as good for your dog's neck alignment. Fitting this collar is as easy as fitting an ordinary collar. 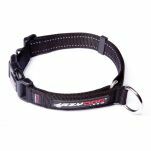 There's a standard steel buckle and pin fitting for greater security and a simple, single line to control your dog’s head. No complicated instructions.. just put it on it and go! The collar first go's around your dog's neck and then the nose strap is slipped over the snout. > Download a pdf on how to fit a Canny Collar here. Designed to go the distance, the Canny Collar is guaranteed for life - how many other training products give you a warranty for life?! In the unlikely event that the collar fails due to a manufacturing fault or material defect it will be replaced free of charge to the original purchaser. 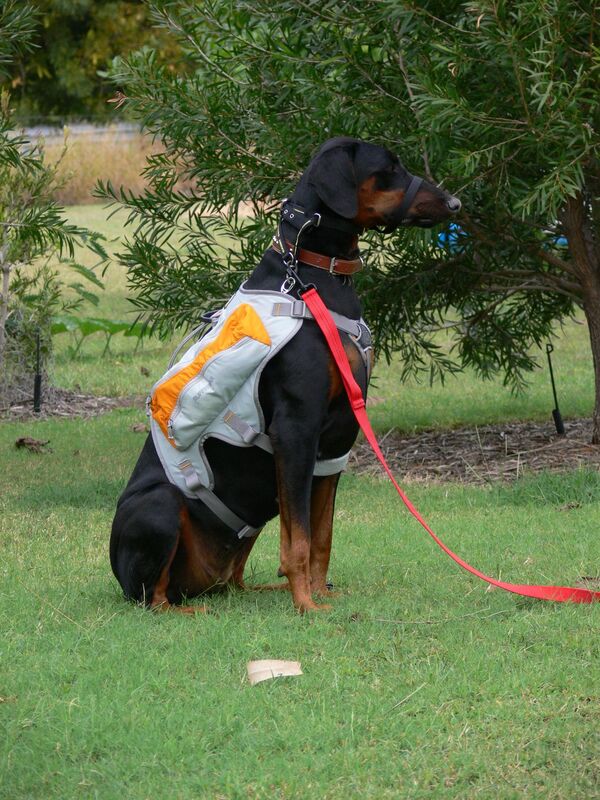 With the Canny Collar you can train your dog to walk on a simple collar & lead with no pulling. 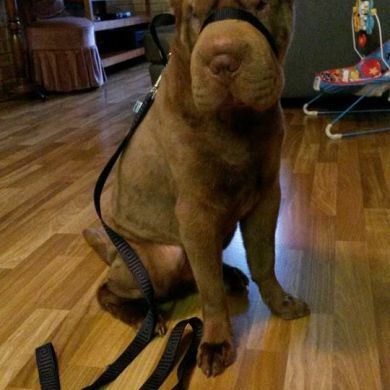 You can move the slip line on and off your dog’s nose as you need to.. and you can gradually train your dog not to pull at all, even when he feels nothing on his nose. No need to take the Canny Collar off when letting your dog run free – simply use the carabiner clips to fasten the slip line underneath your dog’s chin (snout) and away he goes. The Canny Collar is simply a standard collar, generously padded for comfort, with a single line of material (the slip line) going over your dog’s nose. This means he can breathe freely, open his mouth and enjoy his walk. There is little material to restrict his mouth which will help acclimate to the Canny Collar very quickly. 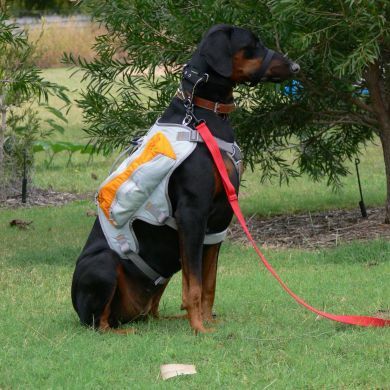 How does it differ from other dog training equipment designed to stop pulling on lead? Firstly, the Canny Collar fastens behind the head rather than under the chin. The immediate benefit of this is that there is no yanking your dog's head to one side or riding up into his eyes. When you are positioned below an animal (such as a horse) it would make sense to lead it from under the chin. However, the horse rider will control the horse from behind the head which makes more sense if you are above the animal. This is why the Canny Collar is unique amongst dog training collars. Secondly, the Canny Collar is a dog training collar rather than a dog restraining collar. 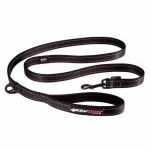 It can be quickly and easily switched into a regular dog collar and lead by alternately flicking the slip line on and off your dog's nose. By doing this you can use the Canny Collar like a 'dog training lead' eventually training your dog to walk on a conventional flat collar. The Canny Collar was voted ‘Best New Product’ shortly after it was launched by the UK pet industry. Since then more than 250,000 dog owners like you have found out exactly why. Kind, safe, comfortable and effective – it's just what you are looking for when wishing to humanely train your dog to walk on a loose lead. Read 33 customer reviews of The Canny Company Canny Collar. The average customer rating is 4.7. This works, no pulling, good quality, easy to put on. My dog does not object to wearing it but likes getting it off though. I walk my two collies and my son,s collie as wee, but because his dog is a youngster my felt the need to try and tow me along the road to the park. Since using the canny collar I can now walk with all 3 and walking is now an enjoyment again I would like to say a big thank you to you. My 11kg cocker spaniel pulled like a steam train., this was causing me to have shoulder and back pain, and no pleasure in walks. We have also tried various harnesses and a gentle leader, which goes under the chin, but the canny collar seems to be a better fit for both the dog and me. It also has a calming effect, an added bonus. Being able to remove the nose band when we are at the dog parkmor xafe is another bonus. We have a 16 month old rescue Rhodesian Ridgeback and I was at my wits end as far as finding a suitable collar so we could have an enjoyable walk that wasn't a strength contest! within minutes of putting on the Canny Collar he was walking happily by my side. I highly recommend this product! I have tried 3 different type of collars and harness to no avail to helping me stop my colliex from pulling. I was very skeptical about this product but alas I have just had 2 great walks and no sore shoulder. I have a 2 yr old Greyhound who was pulling so hard all of the way around to the starting boxes we were both exhausted by the time we arrived there. The Canny Collar has made such a difference to her that now I could walk her to the starting boxes holding her with only one finger and her running times have improved by 1/2 a second. I have a mid size labradoodle that pulls on his lead so we bought a canny collar to stop the pulling. It has taken a few weeks and whilst he initially didn't like it, he is getting used to the collar and does not pull on his lead as he did. 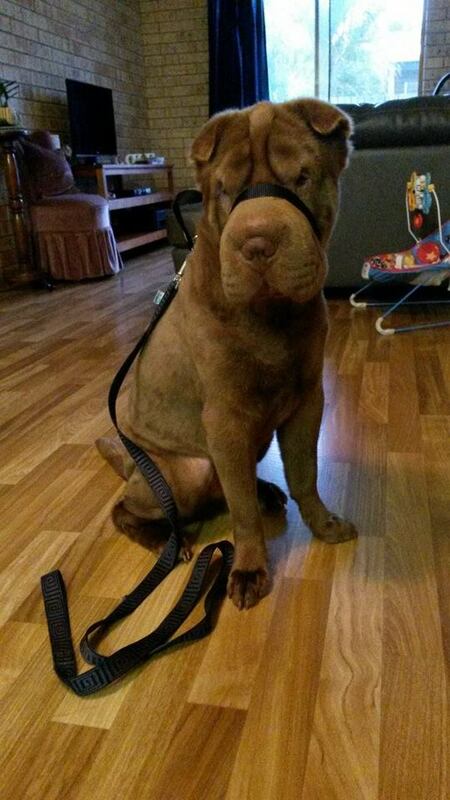 Although the collar helps to control the dog I find that it is very easy for him to slip the loop off his nose. Clancy has worked out that if he holds back and then drops his head it will fall off quite easily. As this dog, who weighs 43kgs, just loves to chase cats I really purchased the collar to help me to control him in that situation. After measuring his neck and ordering the recommended size, I feel that the collar might work better with a size smaller. I do wonder how strong the plastic buckle, that sits under the chin and that the straps pass through, is, after all that is the part taking the strain. The rest of the collar seems to be quite strong. Very Happy with the Canny collar. I have a 2 yrs old Bull Arab which pulls like crazy . I have bought a lot of harnests and then haltis but they never stopped him from pulling . The traditional halti was actually hurting his right due to his strong pulling and the position of leash on the side of mouth ! The canny collar has made my walks much enjoyable and my dog definitely pull less as it gaves me much more control being pulled from the back of the head ! I would definitely recommend as the best option for heavy puller ! !